Peter Rowland is a senior associate in Herbert Smith Freehills’ Brussels office dealing with all areas of EU and UK competition law, including merger control (M&A and joint ventures), cartels, antitrust investigations and advice, compliance programmes, distribution agreements, market investigations and legislative proposals. 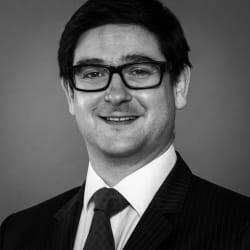 Peter has advised major international clients in a variety of sectors including, in particular, TMT, energy and mining, pharmaceuticals, retailing/consumer goods and chemicals/plastics. Peter is active in speaking and writing about competition law, including speaking at the KNect365 EU Pharma Law Academy, Cambridge, and has run a one-day course organised by UCL on merger control with colleagues. He is also an assistant editor of the mergers chapter of Jones and Van der Woude’s EU Competition Law Handbook. Peter studied law at Clare College, Cambridge, and completed an internship at the European Commission. He qualified as a solicitor in 2004 and worked in London before relocating to Brussels in 2008.